Major tobacco companies have presented a vision of a smokefree world, where smoking prevalence has fallen to minimal levels. This goal has much in common with national tobacco endgame goals and appears to create opportunities for health researchers and smokefree advocates to work collaboratively with a well-resourced industry to achieve a common goal. Yet, despite their public statements, tobacco companies continue to develop new products, such as flavour capsule cigarettes, that enhance smoking’s appeal. This product innovation strategy confirms long-held doubts about the sincerity of tobacco companies’ intentions. We report on our recently published study that examined how flavour capsule cigarettes appeal to non-smokers and smokers. Philip Morris’s establishment of the Foundation for a Smokefree World (FSFW) recognises that many smokers struggle to quit, though says little about the research tobacco companies undertook to ensure cigarettes addicted smokers as quickly as possible.1 The FSFW website states “Let’s End Smoking in this Generation” a call to action made explicit by the CEO, André Calantzopoulos, who is quoted as saying: “We are crystal clear where we are going as a company: we want to move out of cigarettes as soon as possible”. Given tobacco companies’ resistance of policies that constrain their marketing, seen in their trenchant opposition to standardised packaging,2 and in their subversion of excise tax increases,3 their apparent commitment to a smokefree world has surprised many. Responses have included detailed legal critiques of the FSFW’s ‘independence’ from its funder, PMI, and calls for PMI to cease its legal challenges to tobacco control measures, and its advertising and manufacture of smoked tobacco. Researchers have given considerable attention to so-called ‘reduced harm’ products marketed by tobacco companies, such as iQOS (a heat-not-burn tobacco product), and to electronic nicotine delivery systems, developed initially by small companies outside the tobacco industry. While it is very important to analyse these new products and their potential for reducing the catastrophic harm caused by smoking, it is also crucial to monitor how tobacco companies continue to market their smoked tobacco products. Policy innovations in many countries (including NZ) have constrained tobacco marketing; tobacco is neither promoted via mass media advertising or sponsorship nor featured in large, eye-catching retail displays. It is usually expensive to purchase tobacco (due to tobacco taxes), and unappealing colours have replaced the evocative brand imagery that formerly featured on packages. For smokers, we tested four different flavours (Fruit burst, Pineapple & Mango; Rum & Coke, Menthol Blast) and an unflavoured control and four different prices, positioned at the premium, everyday, value and super-value prices levels ($26.40; $24.20; $22.00; $19.80). Because susceptible non-smokers typically access tobacco through social networks rather than by purchasing it, we did not test price with them but expanded the flavours examined to include Hawaiian Mojito and Energy Drink. 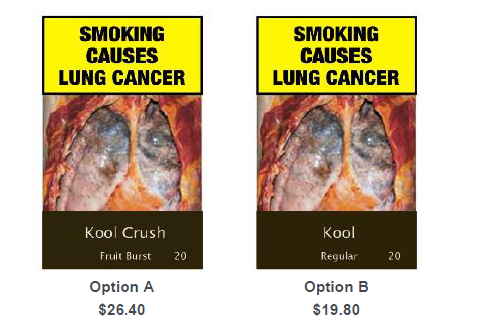 Smokers preferred the unflavoured option to the flavoured options and would pay up to $2.93 more for an unflavoured pack. By contrast, susceptible non-smokers preferred the flavoured sticks, particularly the fruit flavours, relative to an unflavoured stick. While smokers were more likely than non-smokers to take any stick offered to them, they were much more likely to take an unflavoured than a flavoured stick. By contrast, susceptible non-smokers were much less likely to take an unflavoured option compared to a flavoured stick. Susceptible non-smokers were also more likely than smokers to see flavour capsule sticks as smoother, more fun to smoke, more satisfying, attractive and stylish. Our findings suggest at least three important conclusions. First, despite tobacco companies’ claims they wish to see smoking prevalence fall, they are continuing to develop products that are much more appealing to non-smokers than to smokers. Second, as researchers focus on assessing new ‘reduced harm’ products launched by tobacco companies, they must continue assessing innovations in smoked tobacco products. Third, policy makers must be vigilant and courageous, and ensure they future-proof regulations to address industry innovations and guard against marketing initiatives that position smoking as fun, appealing and enjoyable. Tobacco companies’ hypocrisy has been documented and their declared support for a smokefree world requires a high standard of proof if it is to be accepted.14 15 Such standards might be met if tobacco companies announced how they will delist tobacco products, provided a short-term time frame for such action, and abandoned legal action taken to prevent policies that would reduce smoking uptake and prevalence. Until this evidence is forthcoming, and while tobacco companies develop products likely to appeal to non-smokers, their commitment to a smokefree world should be treated by the public and policy makers as another manifestation of industry PR. Waa AM, Hoek J, Edwards R, et al. Analysis of the logic and framing of a tobacco industry campaign opposing standardised packaging legislation in New Zealand. Tobacco control 2016:tobaccocontrol-2016-053146. 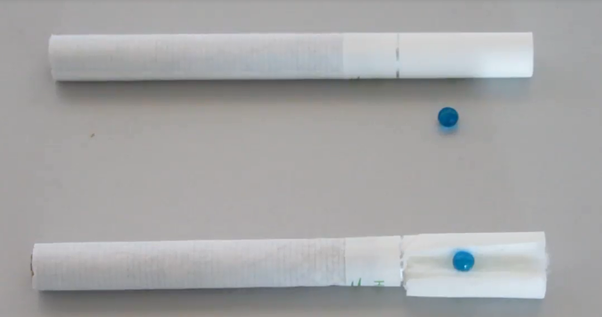 Hoek J, Robertson C. How do young adult female smokers interpret dissuasive cigarette sticks? A qualitative analysis. Journal of Social Marketing 2015;5(1):21-39. Thrasher JF, Islam F, Barnoya J, et al. Market share for flavour capsule cigarettes is quickly growing, especially in Latin America. Tobacco control 2016:tobaccocontrol-2016-053030. Carpenter CM, Wayne GF, Pauly JL, et al. New cigarette brands with flavors that appeal to youth: tobacco marketing strategies. Health Affairs 2005;24(6):1601-10. Public Health Law Center. United States v. Philip Morris (D.O.J. Lawsuit) undated [Available from: http://www.publichealthlawcenter.org/topics/tobacco-control/tobacco-control-litigation/united-states-v-philip-morris-doj-lawsuit. This entry was posted in Uncategorized and tagged capsule cigarettes, Smokefree Aotearoa 2025, tobacco control, tobacco industry by dayhi34p. Bookmark the permalink.